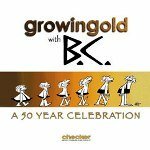 BC, A Fifty Year Celebration! Growing Old with BC: A Fifty Year Celebration/$19.95 and 196 pages/from Checker Book Publishing/words and art by Johnny Hart/sold at book and comics shops and at www.checkerbpg.com. Look up “fun?ny, adv.” in Wiley’s Dictionary, and you’ll find a drawing of Johnny Hart. Look for Wiley and you’ll find one of those unshaven, cone-shaped cavemen that made Johnny Hart famous. But if you try to find Hart himself, you’ll be sadly disappointed. Johnny Hart died in 2007 after writing and drawing that wildly successful bunch of bananas, er, eh, cavemen in the comic strip, B. C.
Look up from almost any of the hundreds of comic strips reprinted in Growing Old with B. C. and you’ll do so with tears in your eyes and deep-throated laughter. How can you not laugh at stuff like: Peter: Do you have any yellow grapes? Curls: Sorry, we’re all out. How about some gutless nectarines? All of this slap-happy visual and verbal word play is drawn in a simple style that looks like you could do it on a paper napkin in a bar when you are half-sloshed. I dare you to try it. You’ll also need to be very clever to imitate Johnny Hart. Surely, he held the record for running gags, most of them featuring a caveman leaning on a boulder lettered with a business name like Dr. Peter: Head Shrinker, Wiley’s Dictionary, and The Curse Exchange. Finally, you’ll need to be politically incorrect. Few cartoonists today can create characters like The Fat Broad and The Cute Chick and survive. How anyone can survive Hart’s demise is difficult to imagine, although the heirs of B. C. seem to be holding their own. If you wish to hold your own copy, don’t delay. This wonderful anthology is highly recommended, and won’t last long on book shelves. Grog!